Chevy Colorado & GMC Canyon > 2nd Generation Chevrolet Colorado and GMC Canyon > Diesel > What do your diesel fuel injectors look like? What do your diesel fuel injectors look like? My truck has 353 miles on it (as in, I've never even filled the tank yet!). 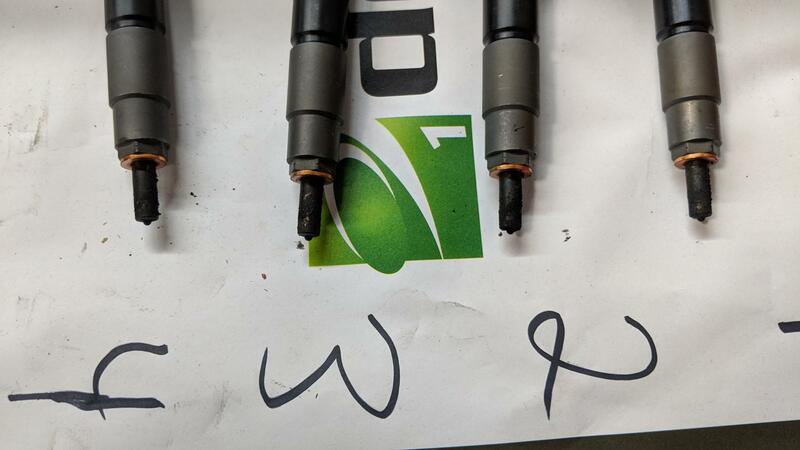 These fuel injectors seem way more fouled than I would expect that soon (see attached photo). Anyone else have photos of their fuel injectors? If so, can you share with the number of miles the vehicle had (and the reason you had them out)? P.S. I'm expecting the dealer to say "that's normal", but I think foreign material got in the cylinder and made for some dirty burning. Diesel is dirty/sooty when burned so I wouldn't read too much into how they look. Assuming they pulled them so they could check for any cylinder damage from your turbo failure by using a borescope? Yes, that's why they pulled them. But the scope was too big to fit and so they couldn't actually see anything with it. It just seems if they're that dirty after 3000 miles, how must they look after 30,000?! Ah, seems like you're assuming this is a cumulative thing that is going to keep building over time and eventually turn into a giant mess. That's not going to happen. Remember, diesel is an oil whereas gasoline is a solvent. Soot is going to happen, injectors aren't going to stay shiny and clean. With such low miles on your engine you haven't really had a chance to let the engine work, get the temps up, etc. Idling, low speeds, low loads will cause more soot than working the engine well. You have low miles and are still within the break-in period so you're not expected to work the truck hard yet. But once you get some miles on it then work it. Get the cylinder temps up, give it good throttle when getting on the freeway. That will help burn off the soot and keep the engine happy. I wouldn't give it a second thought at this point. 30,000 is also your fuel pressure in PSI. The resulting flow out of the nozzles will keep the injectors clean where it matters. What made you check them at such low miles, to see what? I believe this is the poster that had a major engine issue, so this is just part of that. That was mentioned in this thread that literally only had 5 posts before yours. Please read the entire thread before replying. Diesel are dirty but not to that extent, what you see there is what the EGR system does to our new modern diesel which kills these engines. I would think since you had a blown turbo that you were not getting a good burn in your combustion chamber which would also create additional deposits. Run a good diesel fuel additive like Bestline, Stanadyne or Diesel Kleen (gray bottle for summer and white for winter) to help cut some of that crud and if you don't give a crap about your warranty do a full DPF and EGR delete and extend your engines life and increase its performance. Last edited by XFordFanboy; 04-13-2019 at 05:07 PM. I would think since you had a blown turbo that you were not getting a good burn in your combustion chamber which would also create additional deposits. DieselDrax also reminded me that the engine wasn't even through the break-in period.